Don’t Let Fear Overcome You! Fear is one of those emotions that can absolutely stop you in your tracks… it can cripple you and stop you from moving forward. It can make you think things are there that really aren’t and it can make you do silly things for fear of some other recourse. I hate scary movies, haunted houses etc., but I like doing something that scares me to my core that I can choose and control. For example, when I went bungee jumping. To most, that’s very scary and they wouldn’t ever do… I was scared but I still did it and afterward, I felt like I could conquer the world. But as I really started to think about why I’m not where I want to be I realized it’s because I’m afraid. I really thought about it for a long time and decided to do some research to help me figure out my fears and the best way to get over them. This article on overcoming anxiety and fear is brilliant. It illustrates, very quickly, just how powerful our minds are and how our imagination can trick us into seeing or believing things that aren’t even true, or haven’t even happened yet. 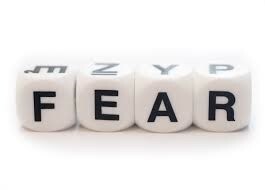 This is a powerful article that provides 33 ways to overcome fear. One of the great things about this article is that it doesn’t pull any punches. If you need a bit of a ‘wakeup’ then this is the article you should read. I won’t ruin the surprise of what’s in store, but suffice to say if you need a big ole’ kick in the pants, then this is the article you need to read! If you’re worried about something in your business, then this article is for you. As entrepreneurs, we are constantly taking risks, and we recognize that there is always the unknown in the risks we choose to take. Where the danger comes in is when we allow our fears of the unknown to stall us, to stop us from taking a leap of faith. This article provides three very clear and doable ways to overcome this fear and keep moving forward. In this podcast, Billy J. Atwell interviews people and neuroscientists to inspire YOU to live a life beyond your fears. Fear is part of everybody’s journey, and on Monday’s and Wednesday’s episodes of FEAR NOT, his guests share one of their biggest fears they’ve had to face and what they did to overcome it. On Friday’s episodes, he interviews neuroscientists and other specialists to discuss what fear is, how it affects our brains, and what we can do to override it. Every episode is full of wisdom and examples to inspire you to face fear to become YOUR truest self and to get YOUR deepest held hopes and dreams. Taking the shame out of failure: The Other F Word. Join conversations about the messy, tragic, funny, inspiring stories that make us human. After listening and reading I’m ready to take on the things that were holding me back – without having to make another jump. Although I still want to jump out of an airplane one day…. I’m just realizing maybe heights is one of my fears. Don’t let anything hold you back from what you want. Walk into the fear don’t run away from it!